Survival Horror is a genre that brings to mind images of zombie dogs bursting through windows and desperate risk/benefit analysis calculations like, “Do I fire four more of my precious bullets, or do I let this monster eat my kidney?” What you don’t usually think of are retro visuals and 2D gameplay. 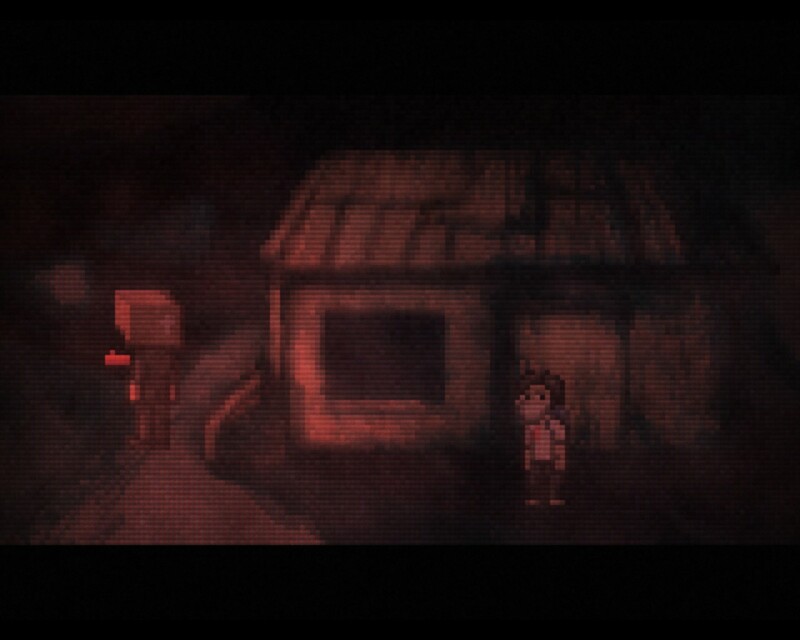 Lone Survivor sets out to prove that the concepts of Survival Horror and 2D Retro are not mutually exclusive. 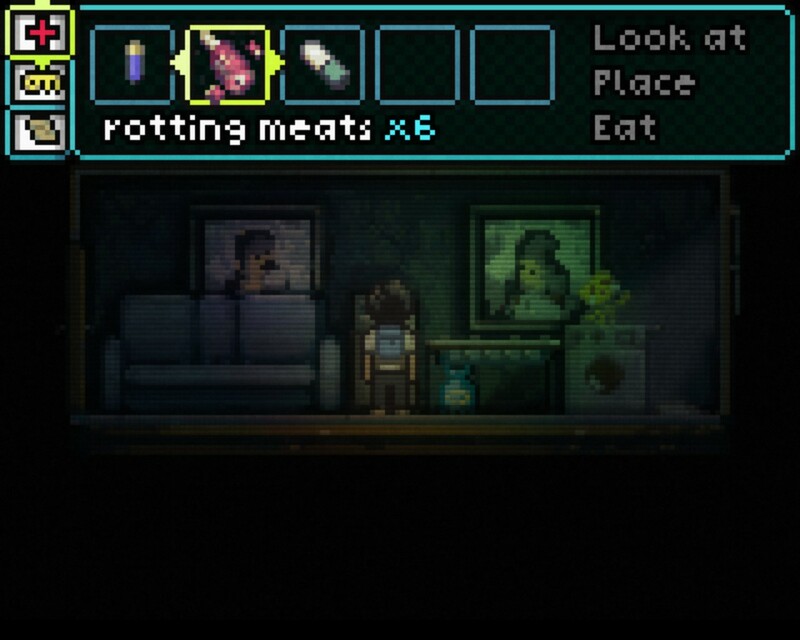 Rotting meat. It does a body good... Oh, apparently it doesn't. As I’ve stated twice already, the visuals are 2D and retro, exceedingly so. Sprites and backgrounds are highly pixelated, but well sculpted enough that there is seldom any vagueness or doubt about what it is you’re looking at… usually. The protagonist of the game is wearing a surgical mask, which one of our staffers misidentified as a massive, insane grin. The graphics are actually so low-res that at times it feels like you aren’t so much playing a game directly, but instead watching extreme close-up camera footage of an LCD somewhere else. 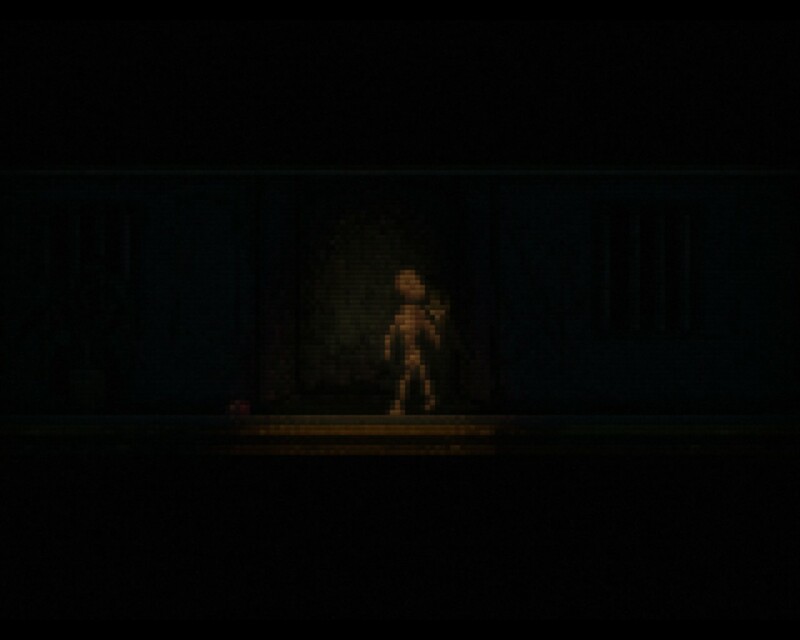 Now, I know this sounds like a bad thing, but we’ve never had a problem with pixels here at BrainLazy, and Lone Survivor uses them quite well. This is particularly true when you realize that retro does not mean simplistic. For one thing, while the game has a limited resolution, its palate is far less limited.  This being a survival horror game, most of the environments are bathed in darkness, forcing you to fire up your staggeringly inefficient pocket flashlight or spark a flare to see what’s going on. When you do, you get a small, isolated pool of light that fades appropriately at the edges. 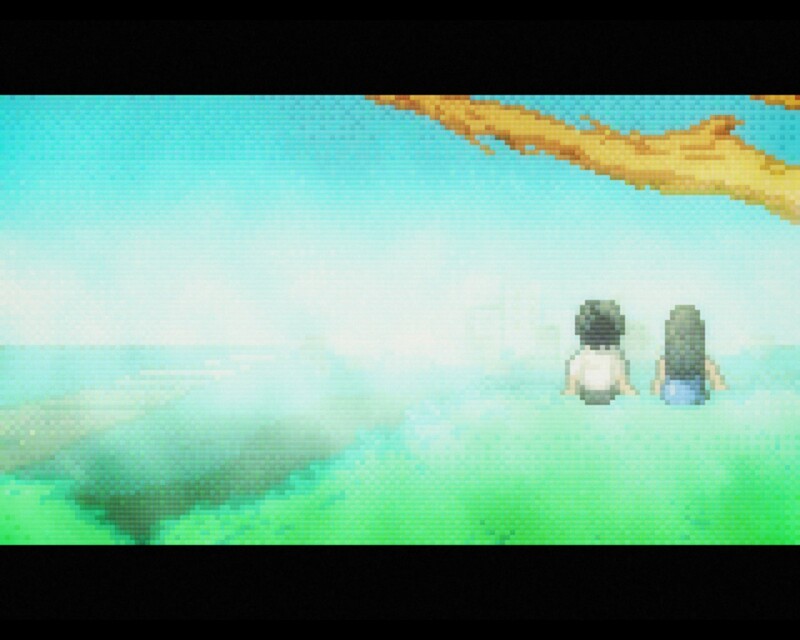 Another thing worth a mention is that while the sprites and environments are pixelated, the effects are not. In a very Eternal Darkness sort of way, depending on the state of mind of your character, you’ll see grimy streaks and stuttery blurs overlaid on the visuals, giving the overall feel of a snuff film shown on reel-to-reel. Now, that’s all well and good, but I’m sure you want to know how these visuals contribute to the most important part of a survival horror game: atmosphere. Brilliantly, that’s how. There is an unmistakable sense of isolation and claustrophobia. The cast of creatures that creep in the shadows are misshapen and grotesque, with scrawny faceless fiends moving with jerky Japanese horror-style movements in some places and bloated, jagged-toothed mutants in others. Sometimes you’ll be forced to contend with things that are much, much bigger, too. And yet, as your character drifts in and out of reality and revery, you are given glimpses of better days, with summery, idyllic settings that make the return to the grimy present day all the more terrible. I ask you. Which is more scary, the monster you can see, or the one you can't? Something I really respect about the visuals, though, is the detail. Firing your gun in pitch blackness (a state that you are quite likely to find yourself in if you’re not frugal with your flashlight) gives you brief bursts of muzzle flash. When you check your map, not only are the locked/blocked doors clearly marked, but the brightness and visibility of the map is directly affected by the amount of light in the area. For me, the little things like that make the difference between a well executed visual design decision and a cost cutting visual gimmick. This design was definitely a good decision. 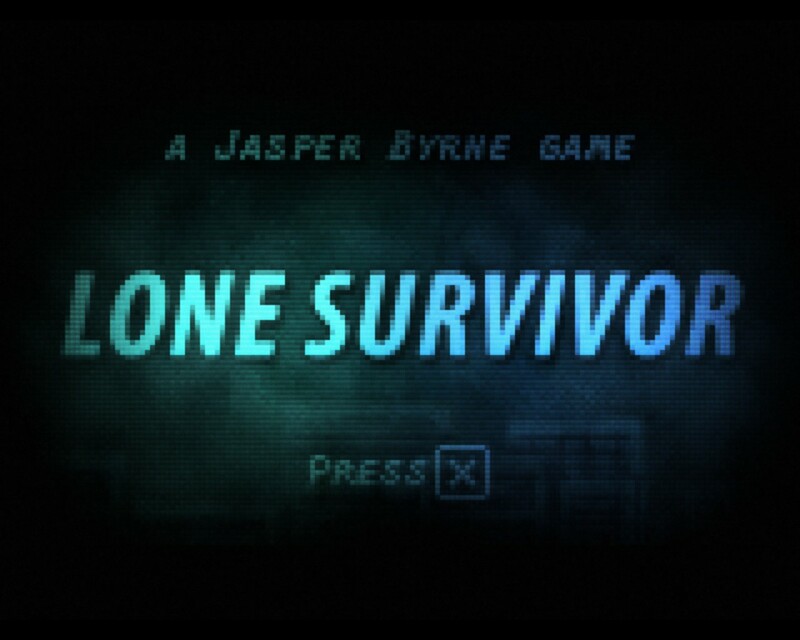 In practice, Lone Survivor combines quite a few elements of different game types. The game it most resembles is the original Silent Hill. From the slowly populated interior maps to the environments mostly obscured from view by one thing or another, it utilizes many of the mechanics of that series, which I consider to be one of the purest in the survival horror genre. Eternal Darkness, as stated earlier, contributes some features, like the presence of skull-bending hallucinations and the need to keep yourself from slipping too far into insanity. Rogue-likes pitch in the need to tend to basic physical needs, like feeding yourself and staving off exhaustion, too. This is achieved by scrounging up what food and supplies you can from the environment. Some food, like the delicious-sounding “dried squid on a stick” or the old reliable “prawn crackers” are edible as found, but others will require you to hunt further. Cans require can openers. Food that cannot be eaten raw must be cooked, which requires a pan and an operational stove. You can brew coffee, but you’ll need a kettle and some water, neither of which are forthcoming. Food items can be combined, and thus improved, and if you are foolish enough to, say, drink milk you’ve found on the ground in a post-apocalyptic nightmare world, the consequences aren’t surprising. Food isn’t the only resource that needs to be managed. Light, for instance, is provided by a battery operated flashlight that absolutely devours the AAs. Since objects in complete darkness cannot be identified (showing up as a “?? ?” indicator) and thus cannot be interacted with, light isn’t just useful for knowing if you are about to be trampled by a nightmare creature, it is a key problem solving tool. You’ll thus find yourself voluntarily wandering through blackness to conserve your precious light supply. Look at the bright side. No monsters in here. Once you get yourself a weapon, you’ll have to keep a tight watch on your ammunition as well, which isn’t the easiest thing in the world. Some people will complain about the combat in this game. It isn’t what you might call graceful. You must switch to combat mode, which disables pretty much every other activity. Once your weapon is drawn, you cannot turn around, instead backing away from your target. Your choices in aiming are ‘forward’, ‘slightly up’, and ‘slightly down’. Believe it or not, you’ll need to use that full range, because it takes far fewer shots to take down a monster if they are delivered to the head, and occasionally something that has fallen to the ground isn’t really dead. More to the point, though, the clunky combat is really a key piece to the atmosphere of the game. You don’t want to fight, because you are outnumbered, under-equipped, and poorly skilled. Fortunately, combat is seldom a necessity. Darkness, while it masks the enemies from you, also masks you from the enemies. Pressed into the background of certain hallways are hiding spots. If they are wide, you can tuck yourself in and sidle along behind a stalking baddie. Alternately, you can drop some rotting meat to attract them to an area where you, crucially, will not be. Mini-puzzles will allow you to distract, block, and divert enemies, and when all else fails, lighting a flare will cause them to go into a tizzy and give you the chance to run. 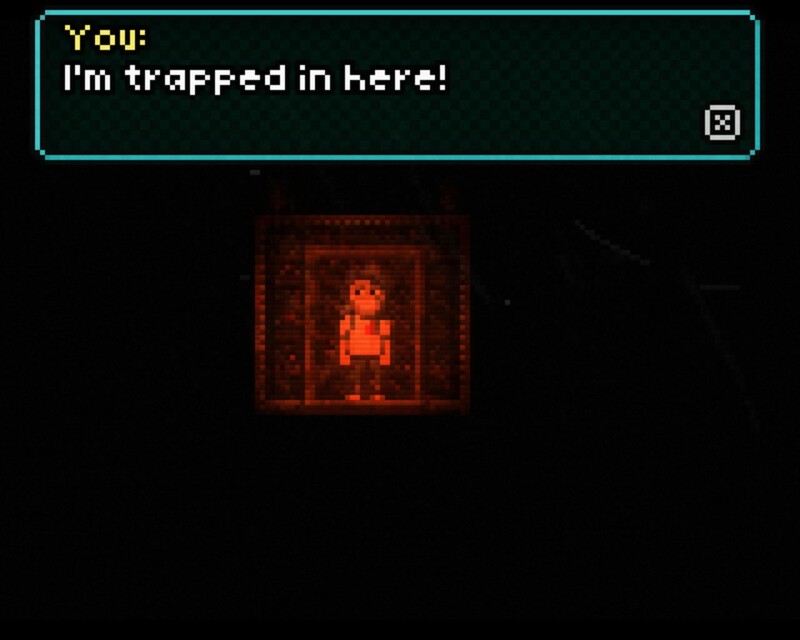 Behind all of this survival and horror, though, is a fairly straightforward adventure game. Simple goals, solved by finding and applying the appropriate inventory items, drive you forward. Really, though, the game is about getting from point A to point B alive and with your sanity intact, and that’s definitely puzzle worthy of a few nights. The game has an expert mode which turns off the screen prompts, and built in guidance in the form of a radio to hint where to go next, a diary to remind you of what you were doing. You save via your apartment’s bed, and mirrors serve as a quick-travel method there and back. If things get really tough, an array of mysterious drugs will facilitate meetings with bizarre characters who will help you… but at what cost? Along with the telltale sounds of monstrosities stalking the halls and other atmosphere enhancing audio, the game honestly has some pretty decent music as well. If you want a better description than that, you’ll probably want to find a review from someone with an actual ear for music. I was mostly listening for the monsters, myself. Just to give you an idea of the sort of game this is, THIS is the fever dream. Quite simply? You don’t know. Something has happened that has left most of the world seemingly converted to mindless, flesh-eating monsters. You’ve been spared, but your provisions are now gone, and you know you need to venture out to find safety and equipment or you’ll wither and die. Games like this often leave you completely alone with the monsters, but not so in this game. Instead you’ll encounter other survivors, including a mysterious woman in blue with whom you seem to have some sort of history, but your memory is almost completely gone. New facts and new mysteries are uncovered bit by bit, and always there is the question of whether or not anything you’re seeing is real. For the subject matter, it is a truly appropriate bit of storytelling. Every decision you make matters, too, because it will guide you toward one of several endings. Every aspect of Lone Survivor is an efficient and well-crafted attempt to ratchet up the tension and isolation. 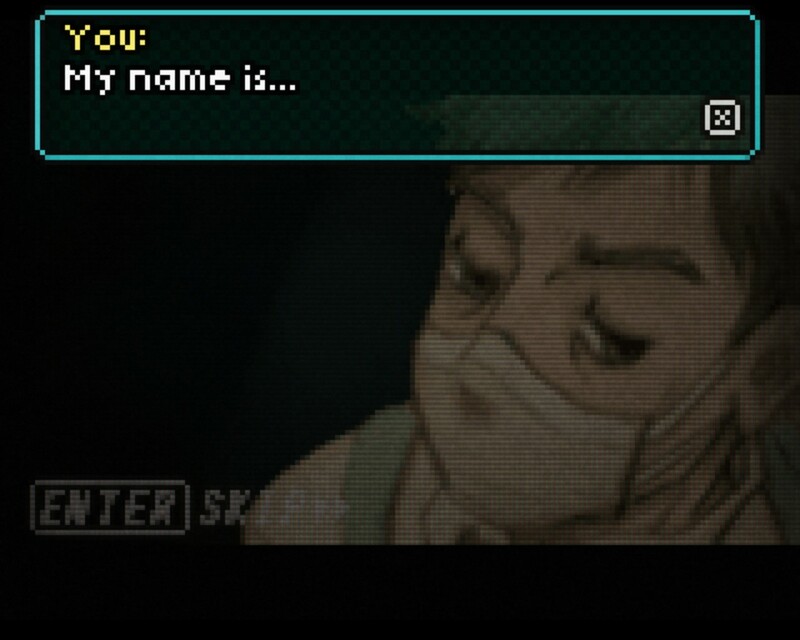 It is honestly enough to make me wonder if perhaps 2D is where Survival Horror really belongs. 9.5 / 10: A chilling and unique take on survival horror that proves that retro visuals don’t rule out genuine tension. Rotting meat. It does a body good… Oh, apparently it doesn’t. I ask you. Which is more scary, the monster you can see, or the one you can’t?